Total Living: 7,900 sq. ft. This sprawling, Shingle Style estate is truly a dream home. 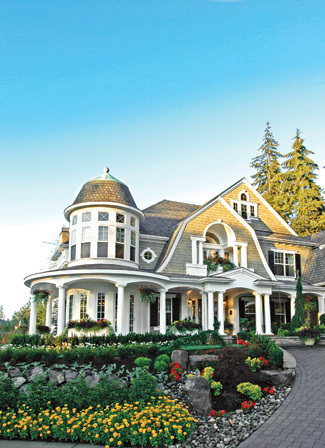 The eye-catching exterior features several gambrel dormers and a dramatic turret. Interesting architectural details abound. The rear of the home is nearly all glass, allowing for dramatic views from nearly every room in the house. A rectangular turret and several curved walls add architectural interest. A close up view of the turret and column details on the porch. A cozy balcony is tucked into the gambrel dormer over the entryway.